SYOGM™ Gold Recovery Plant is a low-cost, highly efficient wash plant and combinations of sluices, using the US patented technology, and capable of trapping very fine gold. In comparison with small scale miners in Tanzania, we have discovered by measuring, that our SYOGM™ Gold Recovering Plant is five times more efficient in recovering gold. The equipment is further capable of recovering much fine gold lost by panning, sluicing and amalgamation. It may be also used as the efficient equipment to recover the remaining gold out of the [tailing]. The method uses no chemicals and is based on gravity. The equipment parts arrive from our headquarter in Tacoma, WA, United States to the mining site. Some of the parts of the equipment have to be acquired in few other countries. The full plant may be assembled at the mining site within few days. The plant is mobile and may be transported from one mining site to another within a day. It may be placed directly at the [tailing] locations to process the remains of gold. There are no mechanical parts except of the pumps, ensuring the longevity that have not yet been determined. It is not sold as such. It is rather acquired and assembled for clients in the program to Start Your Own Gold Mine as part of the consulting and guidance. The assembly, usage, methods of recovery and proper handling are the trade secret of our company Start Your Own Gold Mine and are not shown online or explained in advance. Tailing is the remaining part of already processed ores. Micron is the thousandth part of one millimeter. Sluice is conduit that carries a rapid flow of water. Panning is the act or process in which heavier ores are concentrated by agitating a sample of crushed ore under water in a shallow pan, thus washing away the lighter particles from the sample. Gravity is the state of having weight. Capacity is capability to perform or produce. Nugget is a solid lump of a precious metal (especially gold) as found in the earth. Particle is a tiny piece of anything. The EQV formula determines the gold production. The expanded EQV formula relates to the income out of the gold production. SYOGM™ Gold Recovery Plant is mining equipment that has the potential capacity to handle 80 tonnes of ores per day of 10 working hours. The equipment's potential capacity is 80 tonnes per day. The overall result of the recovery percentage is 98% of gold in the ores. The SYOM™ Gold Recovery Plant consists of several stages on several separate sluices each having width of about 60 centimeters or little more than 23 inches. The first stage recovers the gold particles as small as 5 microns. The second stage recovers further 70% of the remaining fine gold particles. And third stage recovers the rest of the very fine gold particles. The overall result is 98% recovery. If there are 100 particles, in the first stage there will be recovery of 70 particles. The 70% of the remaining articles are 21 particles. There are just 9 particles left for recovery in the third stage. 70% of it is 6.3 particles. The sum of 70 plus 21 plus 6.3 is 97.3 particles. The SYOGM™ Gold Recovery Plant consists of several stages for the equipment to ensure that 98% of fine gold particles are captured. The plant recovers nuggets and fine gold particles. We consider nuggets to be any particle over the 1 millimeter size. The preliminary recovering stage of the plant ensured gold nugget recovery. The next 5 stages of the plant ensure the fine gold recovery. The SYOGM™ Gold Recovery Plant has been designed with large sluices each with several stages of gold recovery, with the final controlling or tailing sluice. The gold recovery plant has been designed to handle higher water flow and throughput. Operation of the plant is designed to run without interruptions during the clean up of the concentrate. Cleaning the single unit out of its 16 units is very quick. The total and full cleaning time is 15 minutes. Cleaning may be performed without the interruption of the washing process. Parallel sluices working together ensure that some of them may be cleaned while others are still working. When excavator is used on the mining site the capacity excavated may easily rise to 600 tonnes per day. A single SYOGM™ Gold Recovery Plant is not enough to handle 600 tonnes in one single day. Additional 7 plants have to be added and constructed in order to handle 600 tonnes of ores per day. The plant may recover gold nuggets, and any gold particles bigger than 1 millimeter. It can recover and is designed to recover very small and fine particles. It can routinely recover gold particles as small as 5 microns. It may be used as efficient and quick recovery method to process [tailing]. 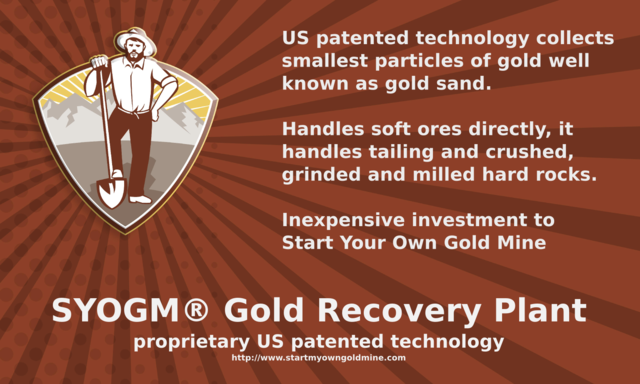 It is superior to many other gold recovery methods and is capable of recovering the highest proportion of extremely fine gold.